Visit Linea Pelle Collection online at LPCollection.com for luxurious lines of Italian leather belts, handbags and accessories for men and women, which are popular with accessory fans and celebrities alike. LP Collections impressive and fancifully embellished assortment features washed leathers in an array of colors for a unique, vintage look and incredibly soft texture. Check back often at 58Coupons.com for the latest Linea Pelle Collection deals, Linea Pelle Collection promotions, Linea Pelle sales and Linea Pelle Collection coupons. When you spend $80 or more at LPCollection.com use this coupon code to get free shipping. Click link to enjoy. Use this promo code to get $40 off your order of $300 or more at Linea Pelle with this coupon code. 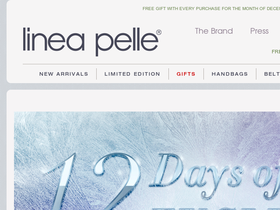 Enjoy 15% off store wide from Linea Pelle with this coupon code. Get 10% off orders over $30 or more from Linea Pelle when you use this promo code.